St. Matthews (SC) Calhoun Co.
Alshon Jeffery (born February 14, 1990) is an American football wide receiver for the Chicago Bears of the National Football League (NFL). He played college football at South Carolina, and was drafted by the Bears in the second round of the 2012 NFL Draft. At the beginning of the 2011 season, Jeffery was named by ESPN as the best overall player in the SEC. He was runner-up for the 2010 Biletnikoff Award, which is awarded to the best wide receiver in college football. Jeffery attended Calhoun County High School in St. Matthews, South Carolina, where he was part of a four-time state championship winning (80–1 record) basketball team. He also played two years of football and was widely recruited, giving a verbal commitment to University of Southern California before switching to South Carolina. Jeffery's younger brother Shamier Jeffery committed to play football for the Gamecocks in 2011, following in the footsteps of both of Jeffery's two older brothers Charles Ben and Darren Ben; both of whom also played basketball and football for Calhoun County High School. "2009 South Carolina Football Commitment List". Rivals.com. Retrieved 2012-08-03. "College Football Recruiting Commits". Scout.com. Retrieved 2012-08-03. "Scout.com Team Recruiting Rankings". Scout.com. Retrieved 2012-08-03. "2009 Team Ranking". Rivals.com. Retrieved 2012-08-03. Jeffery caught five passes for 61 yards in his first five games before making seven catches for 138 yards and three touchdowns against the University of Kentucky. The performance was the second-best single game performance in school history and Jeffery became the third Gamecock in 2009 to earn SEC Freshman of the Week, following defensive end Devin Taylor and running back Jarvis Giles. He was a consensus first-team Freshman All-SEC and first-team Freshman All-American. In a Week 4 contest against Auburn, Jeffery had a break-out performance in a loss. He was only a few yards shy of 200 receiving yards and added 2 touchdowns for the Gamecocks. Another one of his best 2010 campaigns came against in-state rival Clemson where he had 5 catches for 141 yards and a touchdown. Through 14 games, Jeffery made 88 catches totaling 1,517 yards and 9 touchdowns including 8 games with 100 yards or more receiving, and a 108.4 yd/game average. Jeffery was named a Biletnikoff Award finalist, the award given to the nation's top wide receiver. Because of his performances, helping lead the Gamecocks to their first SEC Championship Game appearance, Jeffery was selected as an All-American. In the season opener against ECU in which he caught five passes for 92 yards, Jeffery extended his active streak to 24 consecutive games with a reception. In the 2012 Capital One Bowl, Jeffery caught 4 passes for 148 yards and a touchdown, but was ejected in the third quarter for fighting with Nebraska player Alfonzo Dennard. Despite this, Jeffery was named the Capital One Bowl MVP. Height, weight, and arm length from NFL Combine. Other values from South Carolina Pro Day. On April 27, 2012, Jeffery was selected with the 13th pick of the second round of the 2012 NFL Draft by the Chicago Bears. The pick was announced by former Bears linebacker Otis Wilson. Jeffery at Bears training camp in 2014. 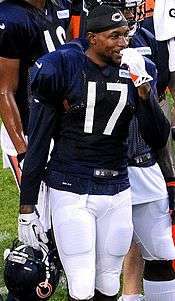 On May 2, 2012, Jeffery and the Bears agreed to a 4-year contract, making him the first player in the 2012 draft class to sign, and the earliest second-rounder to sign since Dallas Cowboys receiver Kevin Williams in 1993.Jeffery made his debut against the Denver Broncos in week one of the preseason, and caught a game-high four passes for 35 yards, though the Bears lost 31–3. In the second preseason game, Jeffery was penalized for unnecessary roughness for fighting Washington Redskins cornerback DeAngelo Hall. Jeffery was later told by coaches to "play smarter". In his regular season debut against the Indianapolis Colts, Jeffery caught a Jay Cutler pass for a 42-yard touchdown. In Chicago's week 5 away game against the Jacksonville Jaguars, Jeffery left the game after catching a touchdown thrown by Jay Cutler. Although the injury did not appear to be significant, x-rays done on the following Monday determined Jeffery broke his right hand, which led to him missing a few games. Though the injury did not require surgery, Jeffery still had to wear a cast. Jeffery eventually practiced for the first time on November 9. Jeffery returned in Week 11 against the San Francisco 49ers, but would injure his knee, and will be sidelined for 2–4 weeks. In Week 15 against the Green Bay Packers, Jeffery was penalized three times for pass interference, nullifying a touchdown and two receptions of 36 and seven yards, as the Bears lost 21–13. Jeffery ended his rookie season catching 24 passes for 367 yards and three touchdowns. In 2013's Week 4 loss to the Detroit Lions, Jeffery recorded his first ever 100-yard receiving game. The following week against the New Orleans Saints, Jeffery broke the Bears single-game receiving yards record with 218 yards, along with recording a career-high 10 receptions. Jeffery broke the record on the final play of the game, a 21-yard pass from Jay Cutler, passing Harlon Hill's record set in 1952 against the 49ers. In Week 13 against the Minnesota Vikings, Jeffery became the first player in franchise history to record two 200-yard games in the same season. In that game, he surpassed his own franchise-record mark set earlier in the season. Jeffery ended 2013 with 89 receptions for 1,421 yards and seven touchdowns. The 1,421 yards are the second-most in team history, behind Brandon Marshall's 1,508 in 2012. The 89 receptions recorded are the sixth-highest in franchise history. After an injury to Lions receiver Calvin Johnson, Jeffery was named to the 2014 Pro Bowl. On January 17, 2014, Jeffery was named the Pro Football Writers Association's Most Improved Player. In Jeffery's third season in the NFL he went over one thousand yards again with 1,133 yards with 85 receptions for 10 touchdowns on 145 targets. At one point Jeffery had a span lasting from November 16, 2014 to December 21st where he had at least one touchdown in each game. In Jeffery's fourth season with the Bears he started off very well. Jeffery went over 100 yards three times in the first four games scoring two touchdowns in that span. On December 30, 2015 Jeffery was placed on injured reserve with a hamstring injury, ending his season. Jeffery's season ended with 54 receptions for 807 yards and four touchdowns on 93 targets. Jeffery would end up at the end of the 2015 season as Chicago's highest pass-catcher with 54 receptions. On February 26, 2016, it was announced that the Bears placed the franchise tag on Jeffery. On November 14, 2016, Jeffery was suspended four games for violating the NFL's performance-enhancing drug policy. ↑ "South Carolina Gamecocks bio". South Carolina Gamecocks. Retrieved 2011-09-08. ↑ "USC's Jeffery Ejected From Bowl Game | WYFF Home - WYFF Home". Wyff4.com. 2012-01-02. Retrieved 2012-08-10. ↑ Hays, Chris (2012-01-03). "South Carolina WR Alshon Jeffery earns MVP at Cap One Bowl despite ejection - Orlando Sentinel". Articles.orlandosentinel.com. Retrieved 2012-08-10. ↑ "NFL Videos: Bears pick Alshon Jeffery No. 45". Nfl.com. 2012-04-27. Retrieved 2012-08-10. ↑ "Jeffery agrees to a four-year contract". Chicagobears.com. Retrieved 2012-11-11. ↑ "Without stars, Bears suffer lopsided loss". Chicagobears.com. Retrieved 2012-08-10. 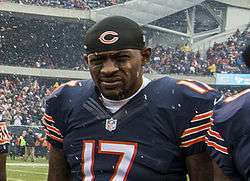 ↑ "Bears rookie Alshon Jeffery gets caught retaliating - Chicago Sun-Times". Suntimes.com. Retrieved 2012-09-02. ↑ "Alshon Jeffery told by Chicago Bears to 'play smarter'". NFL.com. 2012-08-20. Retrieved 2012-09-02. ↑ "Sunday, September 9, 2012 Indianapolis Colts - Chicago Bears Box Scores, Game Results & Summary - USATODAY.com". Content.usatoday.com. 2012-09-09. Retrieved 2012-09-22. ↑ Florio, Mike. "Report: Alshon Jeffery has broken hand". Profootballtalk.com. Retrieved 2012-10-08. 1 2 Wright, Michael (2012-11-06). "Alshon Jeffery back for 49ers game?". ESPN. Retrieved 2012-11-11. ↑ Mayer, Larry (2012-11-09). "Hayden's comfort level, reps both increasing". Chicago Bears. Retrieved 2012-11-11. ↑ Mayer, Larry (2012-11-21). "Jeffery sidelined 2-4 weeks following knee scope". Chicago Bears. Retrieved 2012-11-21. ↑ Mayer, Larry (2012-12-16). "Bears offense continues to struggle in loss". Chicago Bears. Retrieved 2012-12-16. ↑ Mayer, Larry (2013-01-31). "Marshall excited about working with new Bears coach". Chicago Bears. Retrieved 2013-01-31. ↑ Mayer, Larry (2013-12-01). "Larry Mayer's Bears-Vikings game blog". Chicago Bears. Retrieved 2013-12-01. ↑ "Postgame notes: Bears vs. Packers". Chicago Bears. 2013-12-29. Retrieved 2013-12-30. ↑ Wiederer, Dan (2014-01-09). "Bears receiver Jeffery gets Pro Bowl invite". Chicago Tribune. Retrieved 2014-01-09. ↑ Hoge, Adam (2014-01-17). "Alshon Jeffery Voted NFL's Most Improved Player". WBBM-TV. Retrieved 2014-01-17. ↑ "Alshon Jeffery". ESPN.com. Retrieved 2015-12-30. ↑ "Bears place Alshon Jeffery on injured reserve". Retrieved 2015-12-30. ↑ "Bears place franchise tag on receiver Alshon Jeffery". ESPN.com. February 26, 2016. Retrieved February 27, 2016. ↑ Patra, Kevin (November 14, 2016). "Alshon Jeffery suspended four games by NFL". NFL.com.